The Water Music is a collection of orchestral movements, often considered as three suites, composed by German-English composer George Frideric Handel. It premiered in the summer of 1717, when King George I requested a concert on the River Thames. The concert was performed by 50 musicians playing on a barge close to the royal barge from which the King listened with some close friends. George I was said to have loved it so much that he ordered the exhausted musicians to play the suites three times on the trip. Many portions of the Water Music have become familiar. 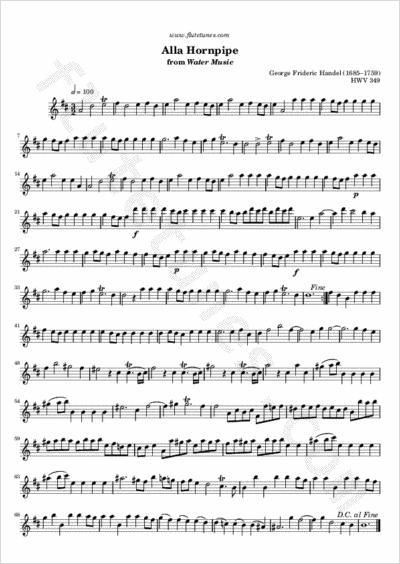 The D major movement in 3/2 meter titled “Alla Hornpipe” is particularly notable and has been used frequently for television and radio commercials.